The late-afternoon sun lights up a huge Martian crater in a spectacular new photo snapped by NASA's Opportunity rover, and the robot's own shadow makes it into the shot. The Opportunity rover was perched at the western edge of Mars' Endeavour Crater when it captured the image. Endeavour is about 14 miles (22 kilometers) wide, and Opportunity has been exploring the many outcrops along its rim since August 2011. 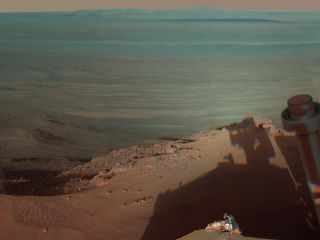 The photo is a mosaic composed of images taken with Opportunity's panoramic camera between 4:30 and 5 p.m. Mars time, mostly on March 9, NASA officials said. The scene is presented in false color to highlight differences in materials, such as the dark dunes on Endeavour's floor. Opportunity just started moving again two weeks ago, after spending more than four months at a site along Endeavour's rim called Greeley Haven. The rover sat out the harsh Martian winter at the site, whose tilt allowed Opportunity to angle its solar panels toward the low-hanging sun. While Opportunity was motionless for a long stretch, it was not hibernating. The robot continued to investigate nearby rocks at Greeley Haven, and scientists analyzed radio signals from the stationary rover to study Mars' interior. Opportunity and its twin, Spirit, landed on Mars in January 2004. The six-wheeled, golf-cart-size rovers were originally tasked with three-month missions to look for signs of past water activity on Mars. Both robots delivered from their separate landing sites, finding lots of evidence that the Red Planet was once a much wetter, warmer place. And then they just kept going, far beyond their warranties. Spirit went silent in March 2010 after failing to get into a good position to wait out the Martian winter, and the rover team declared the Mars rover dead last year. But Opportunity is still going strong, continuing to add to the 21.4 miles (34.4 km) it has driven to date on the Martian surface. Opportunity will soon have company on the Red Planet. NASA's newest Mars rover, the 1-ton Curiosity, is slated to land on the night of Aug. 5. The car-size Curiosity's main goal is to assess whether its landing site is, or ever was, capable of supporting microbial life.